Last week, I showed you the antique headboard that I turned into a coat rack. 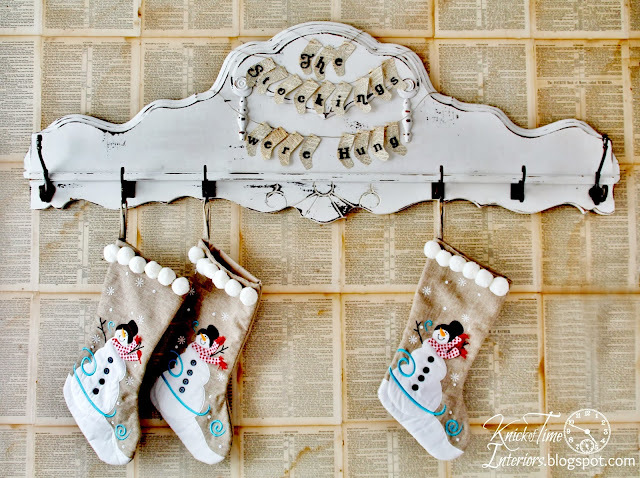 I listed it in my shop, but figured it might not sell for awhile, so I decided to keep it in my living room and use it to hang my family’s Christmas stockings on. I wanted to add something vintage Christmasy-looking to the center of the headboard, so I drew a small stocking template, then used it to cut a bunch of little stockings out of old book pages. I used stick-on glitter letters to add the words, then just strung it on jute twine. After it was all done, I realized it would have been cute to add a white “cuff” to the top of each stocking, but I like it this way too. 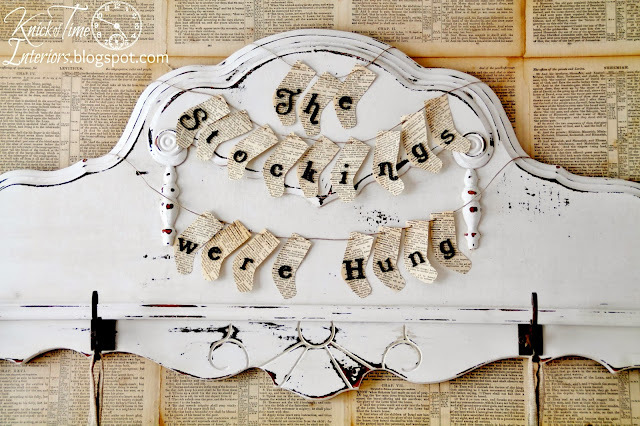 I hung my strand of mini paper stockings…then the headboard sold the next day! I do have other headboards, so I’ll paint another one to use for our stockings, but this one definitely had the most character. Oh well!! The stockings will get hung, one way or the other. SHOP FOR CHRISTMAS STOCKINGS HERE. That is super cute, love it! Have a great Thanksgiving! So cute and different than the usual Christmas words on banners.